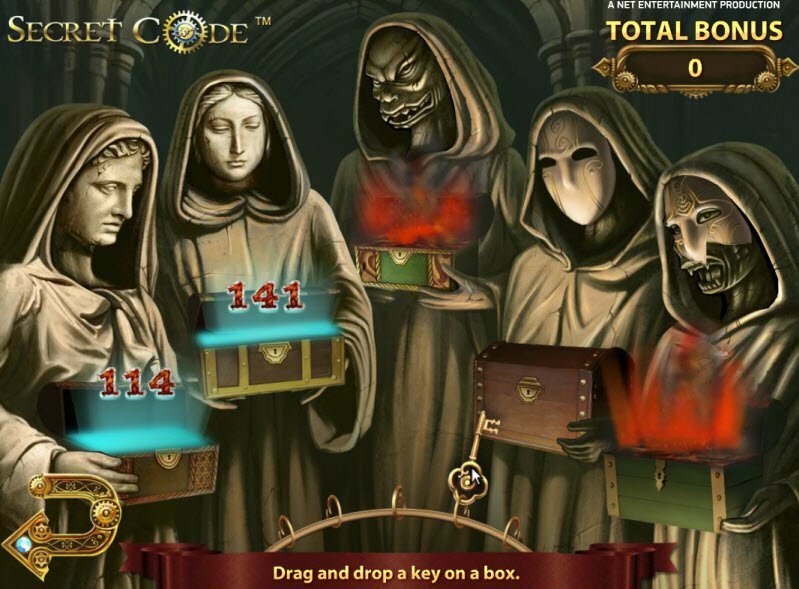 Netent’s Secret Code Slot has a mysterious atmosphere that makes this game a real stand out. The game includes creepy music and enigmatic figures. Spin the reels to see if you can land on the correct secret code that will win you a fortune! 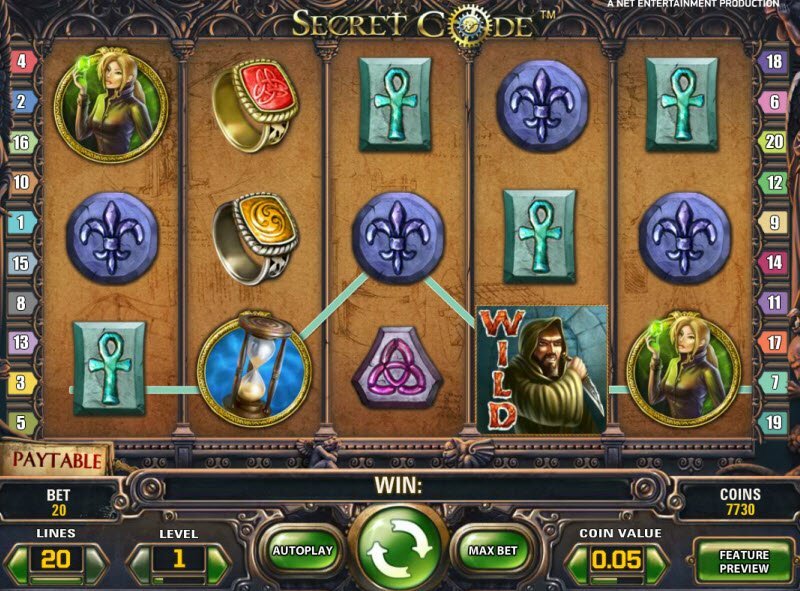 The NetEnt game developers came up with the Secret Code Slot. This game will send you into the shadows of secret societies. The creators left a certain vagueness about the theme that will leave you pondering. Who are these people? What is the Secret Code? How do I win more money? The game includes 20 paylines, a Wild Symbol, and Scatter Symbol. Be sure to check out the Bonus Game where you stand before disguised individuals to choose a secret prize. Although the graphics aren’t the best in the business, the game designers did a superb job in conveying an atmosphere of mystery and intrigue. The voices in the background sound like the echoing of monks singing down a broad corridor. They convey a sense of secrecy and eeriness. Something tells me that the game developers really got into The Da Vinci Code book series for this one. Meanwhile, secret society emblems and rings decorate the reels along with photos of mysterious detectives. The key in the lock represents the Bonus Symbol and activates the Secret Bonus Game. Trigger this feature, and you’ll enter a secret room where hooded and masked individuals greet you with chests filled with prizes. 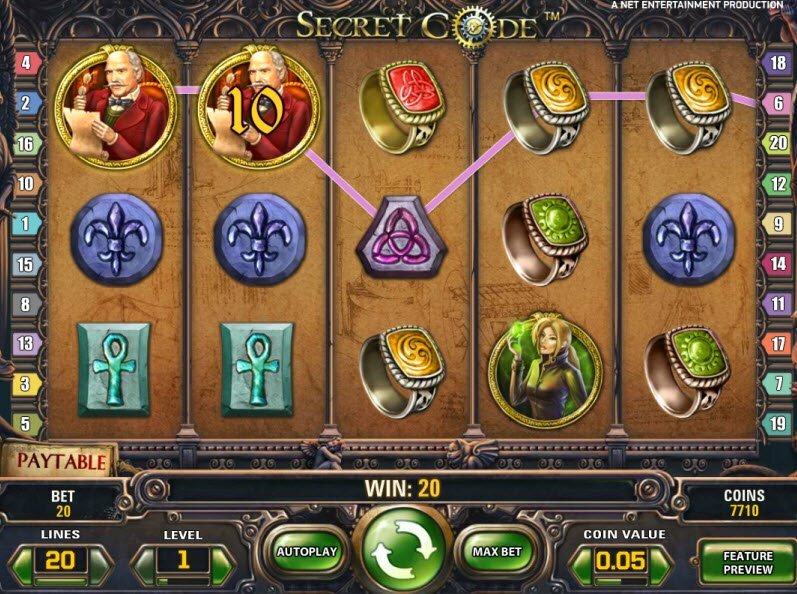 The Secret Code Slot bonuses include your standard fare of features found in most slot games. You’ll find both a Wild and Scatter along with an Auto-play, Max Bet, and Bonus Game. The key in the lock represents the Bonus Symbol and activates the Secret Bonus Game. Trigger this feature, and you’ll enter a secret room where hooded and masked individuals greet you with chests filled with prizes. Select a key to discover the secret within these mysterious boxes. The man in the robe carrying a dagger seems ominous, but you’ll want him showing up on your reels! He represents the Wild Symbol and substitutes for all symbols except the Scatter and Bonus. The emblem serves as the Scatter. 3 or more Scatters activate Free Spins. 2 or more increase the multiplier by the number of Scatters present. During the Free Spins, payouts are multiplied by that number so you’ll win much more.